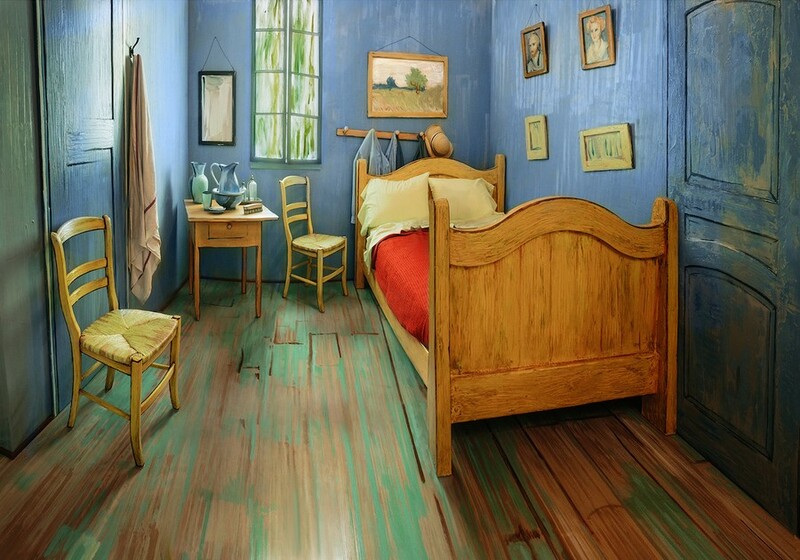 A replica of Van Gogh’s bedroom, now available for rent on Airbnb for $10 a night. Now through May 10, the Art Institute of Chicago (AIC) is featuring a special exhibit entitled Van Gogh’s Bedrooms that explores the artist’s lifelong search for a home—that little yellow house he finally found in Arles, France. The house and the landscape of Arles inspired many of his paintings, and Van Gogh’s time there was the beginning of his most prolific years as an artist. Although he stayed here for only one year (1888–89) before he was committed to an insane asylum, Van Gogh continued to paint scenes of Arles from memory, turning out new works every few weeks. He was at the height of his artistic career when his madness became too much, and he died by his own hand in July 1890. The exhibit opens with a map of the 24 different places Van Gogh lived during his 37 years. After leaving his family’s home for boarding school at age 11, Van Gogh never lived in one place for more than two-and-a-half years. The exhibit succeeds in portraying Van Gogh’s sporadic jumps across Europe, but, to a greater extent, it stresses Van Gogh’s restless nature before he embraced art. Van Gogh’s drawing of his family’s barn, completed at age 10, shows obvious inherent talent, yet this talent was sadly suppressed for most of his short life. Only after failing at multiple careers—from art dealer to minister—did Van Gogh finally decide to become an artist in 1880 at the age of 27. And it was not until 1885, five years before his death, that Van Gogh created The Potato Eaters, the first painting in what is now recognized as his distinctive personal style: thick brush strokes paired with distorted lines and dimensions. In fact, every painting that comes to mind when you say “Van Gogh” was made within those five years. To execute this exhibit, the AIC partnered with the Van Gogh Museum in Amsterdam and the Musée d’Orsay in Paris, thus gaining access to many of the artist’s personal letters written to his brother Theo about the house in Arles. For a man who long struggled with depression in a world unable to understand him, Van Gogh never sounded happier than when he wrote about his new little yellow house. The inclusion of the letters creates great suspense, as do the paintings of the chairs (one for Van Gogh, thatched and humble, and one for Paul Gauguin, deep walnut and scattered with books). At the time, Gauguin was coming to visit, and Van Gogh was decorating the room to his taste. Turning the corner expecting to lay eyes on the famous paintings of Van Gogh’s bedroom, the visitor instead greets a great yellow wall. A window peeks into a life-sized bedroom with two thatched chairs and a red bed. It is Van Gogh’s room, brought back to life. The space is simple, sparse, and smaller than the average dorm-room single. Seemingly mundane, this is the room that inspired one man who had finally found his home. Van Gogh’s greatest skill was shining beauty and interest on the ordinary. By recreating his little bedroom, the AIC lets us see this magic at work when, turning one more corner, we see the room from Van Gogh’s perspective. The colors are brighter, the strokes are thick and confident, and the room appears to move like it has a life of its own. Van Gogh painted three versions of his little room. After the first suffered water damage, he had his brother send it to him at the asylum, where he painted the second two, fusing his memories of Arles with the first painting as his model. The exhibit presents the three versions—which are almost identical upon first glance—to contrast the outlook of a man living happily at home with that of one reminiscing on a fond memory. With his maddeningly desperate need to make sure that his image of home was not destroyed, Van Gogh ensured it would live on by painting it over and over. And now the AIC has constructed it anew.